We had intended to explore Crater Lake National Park, but the CLOSED signs turned us away. We mourn for all our treasured public lands and the stewards that tend them. 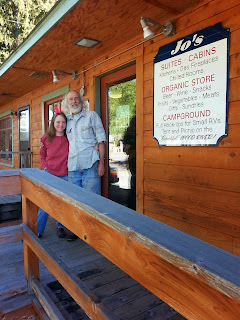 The folks at Jo's Organic Deli at Fort Klamath said we were their first lodging customers all week. We camped behind their sweet little establishment by the banks of the pretty Wood River (and sang the song several times). Before that we enjoyed the High Desert Museum just outside of Bend. On our trip over the mountains into Ashland we traveled on the Volcanic Legacy Scenic Byway, an All American Road. We're starting to think of scenic byways as roller coaster rides: often no guard rails and in the case of this route, 9 miles of a 5% down hill grade with lots of curves!